The word spirit has been interpreted in many ways, and the adjective spiritual has been so misused and abused that it has lost much of its real meaning. Yet these terms are so basic in Euro-American culture that one can hardly avoid using them. Therefore I must explain precisely the meaning I give them in this book by referring to what occurs at the beginning of two hemicycles of the Movement of Wholeness. For the present purpose I will consider the hemicycles beginning at the symbolic Midnight and at the Noon of the cycle. At each of these points, the principle of Unity most characteristically impresses its power upon the Movement of Wholeness. This power is spirit. During the Midnight phase, when the principle of Unity is most intense, almost overwhelming, spirit is the dynamism of the supreme Compassion of the Godhead state. The release (at a nearly totally subjective level) of this Compassion starts the process of formation which, as the image-making divine Mind in operation, leads to the creation of archetypes and eventually of the Word (or Logos, the totality of these archetypes). At first altogether subjectively, then more and more objectively, this process is "mental." It has been mythologized as the work of different levels of creative Hierarchies, but the driving power at its core is spirit � the Compassion of the Godhead gradually revealing its purpose in answer to the cosmic need which must be met. At the symbolic cosmic Sunrise, when kinetic energy is let loose in the creation of the physical universe, spirit acts as the power that keeps the rising and aggressive impulses of the principle of Multiplicity from operating as an explosive, random outburst, compelling it to be released in cosmic quanta (or packages) of energy. Thereafter, spirit may be thought to be the still mysterious power manifesting to us as gravitation. Eventually it manifests as "life," the power that integrates material and chemical elements into the existential wholes we call cells and that maintains the integrity of the multiplicity of biological orders, families, genera, and species developing in the earth's biosphere. (1) As evolution proceeds, these systems of biological organization actualize the appropriate archetypes that were formulated between the symbolic Midnight and Sunrise. Eventually an immense variety of classes, orders, families, genera, species, and varieties develops within a biosphere feverish with the differentiation of specialized features. By now the biosphere is teeming with a multitude of lives in the throes of conflicts, catastrophes, and cycles of disease and barrenness necessary to avoid a plethoric crowding of entities feeding on one another. Then the Movement of Wholeness, having allowed the principle of Multiplicity to dominate the earth, reverses its direction. The archetype Man takes a more concrete form, gradually revealing its complex plenitude of being through a series of Avatars. In and through the series of planetary, racial, and cultural Avatars, and eventually through personages with definite missions and illumined individuals nearing the consummation of humanhood in the "divine Marriage," spirit acts within a human framework. It seeks to integrate archetypal Qualities � Letters of the creative Word � with generic human nature (which it slowly but progressively transforms), and with cultures and social communities. Also, whenever possible archetypes, are actualized in and through individualized persons eager to experience attunement with their essential beingness, that is, with the particular spiritual Quality it is their dharma to embody in everyday living, through ever-renewed acts of theophany (divine revelation of the spirit within). Spirit therefore operates in the Movement of Wholeness as an integrative principle. In my book The Planetarization of Consciousness, which was concerned mainly with the Day period of the entire cycle of being, I strongly emphasized the concept of ONE as the universal principle of integration � a catalytic agent whose "presence" is effective in drawing together disparate elements at all levels of material, organic, and human organization. I particularly stated that this word did not refer to "the One" or to a Supreme Being, but to an impersonal integrative principle to which no particular form or identity could be given. This integrative principle operates in the whole cycle of being in two basic ways: as the Compassion radiating from the Godhead state at the symbolic Midnight � and after Noon as the power seeking to integrate human organisms (in their successively developed biological, cultural, psychic, intellectual, and individualized aspects) with spiritual Qualities. Because spirit is the "power" (shakti) in and through which the principle of Unity operates within the Movement of Wholeness, its action is most intense when this principle reaches maximum strength; its intensity decreases when the principle of Multiplicity waxes. Yet the drive toward an ever greater and more differentiated multitude of relatively separate forms of existence also operates within the Movement of Wholeness. One may think of it as anti-spiritual, but this may be misleading because its operations take a great variety of forms. While it is active in egocentric desire and the will to be different and unique at any cost, to speak of it as "evil" may be confusing. The process of individualization certainly is not evil in itself, although religions often misunderstand its nature. Above all, one should take care not to personalize this power of differentiation, that is, not to give it a "human, all too human" character. It is simply the trend toward an expansive multiplication and fragmentation of being, and it opposes the integrative action of spirit. One may consider it the shadow aspect of being, but only after the human stage of evolution has been reached. For only after the power of the principle of Unity rises in and through humanity does the "sun" of Unity begin to shine. Then can the opaque materials of which human beings are made � not only as physical bodies but also as opaque systems of mental beliefs and religious dogmas � cast a "shadow." Shadows begin at the Noon of the planetary cycle because the future state of Illumined Man becomes a potentiality then, as soon as the avataric series begins. A very small vanguard of human beings already has actualized this potentiality (at least partially). But the "sun" of avatarhood casts an inevitable shadow when it strikes those human beings who as yet cannot or deliberately refuse to see its light. As the consciousness and the will of human beings becomes increasingly translucent, the shadow becomes less dark. In human beings operating at the tribal level or in religious or sociopolitical communities still strongly unified by an original avataric revelation, this shadow manifests as the product of a centrifugal force alienating the person from the unanimous whole. But when the process of individualization begins as a definite transition between the still biologically conditioned state of culture and the planetary, Pleroma state, a special situation develops. As the principle of Multiplicity wanes, its power becomes internalized or introverted, giving a sharper, more exclusivistic character to the ego � that is, to the individualized capacity to adjust to increasingly unique family and sociocultural situations. (2) As the principle of Unity simultaneously waxes, it strengthens the operation of the true "individualizing principle" or "higher self" (terms which will be defined more precisely in Chapter 9), which seeks the integration of a spiritual Quality and a human being. Thus the nearly unavoidable conflict between Unity and Multiplicity begins to operate more definitely subjectively � that is, in the human consciousness and mind. It is experienced as that between the exclusivistic ego ("I am uniquely what I am and all I possess is strictly mine") and the "higher self." The conflict becomes psychological. What the psychologist usually fails to realize, however, is that what Jung (in a limited sense) called the Shadow is built by the same force that once generated an immense multiplicity of life species out of the one ocean where life is said to have begun. But in human psychology this force operates within the new frame of reference generated be spirit since its power began to rise at the symbolic Noon � that is, within the psychism of human beings operating in cooperative communities. Though waning, the power of Multiplicity and differentiation is still dominant during the Noon-to-Sunset quarter of the cycle, the period during which "human history" takes place. Most people today are still dominated by its internalized manifestation � a strong, exclusivistically self-concerned and self-limiting ego-will, which casts the darkest kinds of shadows upon what pejoratively has been called "the human condition" by existentialist philosophers shocked by the seeming absurdity of existence on earth. Indeed, the problems human beings face seem insurmountable as the process of individualization rages in an anarchistic human world increasingly featuring mental as well as physical terrorism and torture. Nevertheless, as the principle of Unity waxes spirit is released through Avatars inspiring the formation of religions and cultures, and eventually through individuals who realize and actualize their innermost, divine center (a spiritual Quality, a Letter of the creative Word). 2. 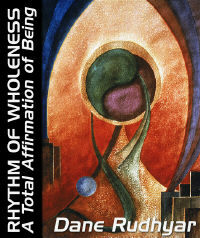 I mentioned a special approach to this internalization of the trend toward Multiplicity in an early series of articles (1942-43) now revised and integrated in my book The Pulse of Life, which was later retitled Astrological Signs: The Pulse of Life by the publisher (Shambhala Publications, Boulder, 1970). This book interprets the cycle of being in terms of the seasonal cycle of the year and the zodiac. See pages 21-25.